What emanates from these speakers is black metal as harrowing as sheer spite and hatred in sonic form. The “production” on this demo is fairly lo-fi and sounds like it was recorded on a four track. It has a thick fuzziness to it, although it is not entirely incomprehensible. 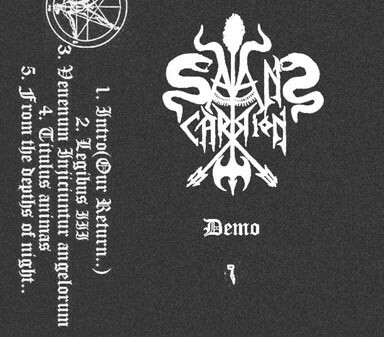 It is somewhat in the vein of early Xasthur and some of Vlad Tepes‘ recordings. The lethal riffs are definitely noticeable and the torturous screams that accompany it are truly scornful. All in all, this will pass as an enjoyable demo for those of us who aren’t too fussy about production and put the focus on the actual feeling of the music. The only thing I’d suggest the band to improve on is better sound and visuals overall. The ideas and titles are all well-thought out and brimming with passion. I guess the only way to listen to this demo is through contacting the band and ask if they can send you the files to download, or if you’re lucky, they might still have some copies left.